I can see no reason why fans of the first Spider-Man should not enjoy the second. 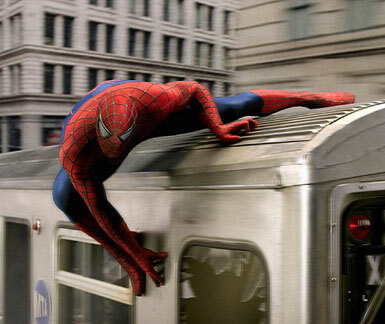 Virtually the entire cast and crew are still onboard, including director Sam Raimi and star Tobey Maguire, and Spider-Man 2 feels less like a separate movie than an uninterrupted continuation of the first, keeping everything the original did right while smoothing out some of the rougher edges (the corny dialogue quotient, while not entirely absent, is noticeably reduced). If there’s anything here that makes the first superior to the second, it’s that it was new and fresh, while here we are reuniting with established characters. But in every measurable way, Spider-Man 2 is equal to or better than Spider-Man. We pick up some time after where the first film left off, with Peter Parker (Tobey Maguire) having moved out from Aunt May’s (Rosemary Harris) and now attending college, but his once high grades, along with the rest of his life, are suffering from his anguish over his unrequited love for Mary Jane (Kirsten Dunst). He loves her, and she loves him, but he believes they cannot be together because he fears it would place her in danger if his enemies discovered his identity. Mary Jane has grown tired of waiting and is engaged to astronaut John Jameson (Daniel Gillies), the son of tabloid reporter J. Jonah Jameson (J.K. Simmons), whose Daily Bugle relentlessly decries Spider-Man as a menace, although he has become a hero and a legend to many New Yorkers. Peter also still lives with his feelings of guilt over the death of his Uncle Ben (Cliff Robertson), while his relationship with his once close friend Harry (James Franco) is growing more distant as Harry combines a burning desire to fill his father’s (Willem Dafoe) shoes with a neverending hatred of Spider-Man, whom he believes murdered him in cold blood. Little does he know that his father was the dreaded Green Goblin, nor that his friend Peter is the man he plots revenge against. And all of Peter’s personal problems and inner turmoils have manifested themselves in an alarming way- he starts losing his superpowers, a development that comes at the worst possible time, as a new super villain is in the works. Dr. Otto Octavius (Alfred Molina), a mild-mannered but brilliant scientist attempting to harness the power of the sun as an alternate energy source who has grafted four mechanical limbs to his spine, suffers a catastrophic accident while demonstrating his new technology, and when the dust clears, Octavius has become Doc Ock, a powerful, power-mad creature with immense strength and reflexes to rival Spider-Man’s. Virtually every cast member from the first film, even relatively minor characters, reprises their role in the sequel, ensuring strong continuity and a sense of simply picking up where we left off. Even Cliff Robertson and Willem Dafoe, who were killed in the first film, return in dream sequences. Of the series veterans, Tobey Maguire is a notch up from his first outing, as Peter is agonized by weighing Uncle Ben’s credo ‘with great power comes great responsibility’ and his own instinctual desire to help people against his wish to live an ordinary life and be with the woman he loves. As before, Maguire does a solid job making Peter a human and sympathetic individual with vulnerability and depth, one of the best portrayals of a comic-book superhero next to Christopher Reeve’s immortal Clark Kent in the original Superman and Christian Bale’s Bruce Wayne in Batman Begins and The Dark Knight. Kirsten Dunst returns as Mary Jane, who’s trying to move on despite her love for Peter, and James Franco has little to do besides brood as he nurses thoughts of revenge against Spider-Man. Rosemary Harris is back as Aunt May, supplying words of comfort and support (including a hero pep talk that suggests she might not be oblivious to who Spider-Man really is), and Dylan Baker appears briefly as one of Peter’s teachers. J.K. Simmons has a somewhat expanded role as J. Jonah Jameson, the father of Mary Jane’s husband-to-be. 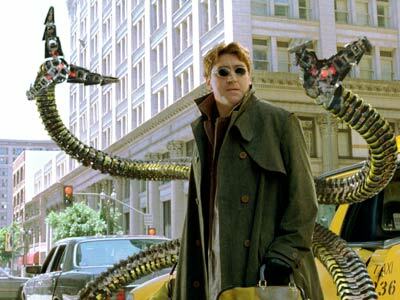 With his almost indestructible mechanical limbs and reflexes and building-climbing abilities to match Spider-Man’s, Doc Ock is a more imposing adversary than Willem Dafoe’s Green Goblin, and Alfred Molina almost entirely avoids any campy scenery-chewing, but his grimly determined seriousness also means he’s not as much over-the-top fun (although when he threatens to ‘peel the flesh off her bones’, he sounds like he means it). There’s a hint of a tragic angle to his character- in the couple of scenes with him before his accident he is a gentle, soft-spoken man- but this doesn’t have as much effect as it might have if it had been more developed (the first film made even more fleeting attempts to round out Dr. Osborn). There are amusing cameos from Bruce Campbell (Raimi’s nod to his Evil Dead days) as a snooty usher, and Hal Sparks, who shares an elevator ride with Spider-Man. Visually, Spider-Man 2 is a little more ambitious than Spider-Man. The fights between Spider-Man and Doc Ock are more large-scale (and more destructive) than those between Spider-Man and The Green Goblin. Most impressive is an excitingly-staged sequence in which Spider-Man’s abilities and strength are pushed to the breaking point to stop and out-of-control train. As before, Spider-Man is unmasked at a key point in the most intense struggle, allowing us to see the strain on Peter’s face. There’s plenty of humor, including much of the self-referential variety. We get a street performer warbling a bizarre version of the Spider-Man theme song from the 1960s cartoon series, and a montage of Peter finally throwing away his Spider-Man costume and enjoying his newfound carefree bliss to the tune of “Raindrops Keep Fallin’ On My Head”. Amid the light-hearted fun, a moment also occasionally pops up of surprising depth; in this case it’s Peter’s confession to Aunt May about his feelings of responsibility for Uncle Ben’s death, this movie’s equivalent of his lengthy monologue/love confession to Mary Jane in the first film. The romance quotient, which was a substantial part of the first film, is quite high here, as virtually all of Peter’s actions are motivated by his love for Mary Jane. This isn’t a perfunctory subplot to broaden the movie’s appeal, it’s a major part of the storyline; in fact, their relationship (or lack thereof) forms the real backbone of the movie, with Spider-Man vs. Doc Ock as more of a subplot than vice versa. There’s an awkwardness, a sweetness, and a sensitivity in their scenes together, and amid all the high-flying action and special effects, there’s still the presence of a warm heart beating under the surface. An entirely worthy sequel to the first film, Spider-Man 2 continues to serve up romance, humor, and action in satisfactory quotients while deepening the character relationships established in the first film. If the third installment in the series, scheduled for summer 2007, continues to maintain the seamless continuity, along with the energy and humanity of the first two, the character of Spider-Man will be well-served, and audiences will be well-served with three solidly entertaining and engaging films.